Michael Boakye-Yiadom, a research fellow at the Institute for Educational Planning and Administration at Ghana’s University of Cape Coast, speaks during the inaugural Global Partner Studio institute. UB’s Experiential Learning Network kicked off its inaugural Global Partner Studio institute on Monday afternoon. Over 50 students, faculty and academics attended the institute’s opening event in the Student Union. The ELN provided insight into the partnerships UB has created and maintained with universities all over Africa and the Caribbean. The event was also live streamed for audiences from partner universities. The kickoff presentation event featured four speakers from Tanzania, Ghana, Zimbabwe and Jamaica, with two breaks for questions and answers, and a reception with opportunities for informal interaction. The event mainly focused on technology transfers between UB and other universities in Africa and the Caribbean. The transfers would help local communities grow and develop, as well as encourage the advancement of pedagogical aspects in curriculum. A prominent topic during the event was UB’s focus on combating the HIV epidemic, which continues to plague Africa and the Caribbean. Since UB has an internationally recognized HIV pharmacology research program, its partnerships with universities in Zimbabwe and Jamaica have especially focused on the exchange of medical resources and technology. Charles Maponga, a UB alum, is the University of Zimbabwe’s principal investigator for the NIH Fogarty International Center HIV Research Training Program. Maponga said he believes UB’s joint program with UZ is bridging cooperation between the academic, public and private sectors in Zimbabwe. “As part of policy, we rally academics and then we bring in the industry and we’re all linked through international partnerships,” said Maponga, who is an academic and government consultant. The parternship allows public and private sectors in Zimbabwe to recognize and supplement UZ’s collaboration with UB. “The relationship between UZ and UB is now so big that it is recognized at the government level. The program that we’re looking at now, that is the special economic zone, is applying to [U.S. Agency for International Development]for support to use this as a national program,” Maponga said. UB’s global partnership with the University of West Indies had similar results with the creation of the SUNY-UWI health research task force. The task force presented during last year’s Caribbean Action 2030 conference, hosted by the United Nations. The task force focuses on achieving sustainable development goals and addresses health initiatives. UB students, who visit UWI through exchange programs, also help members of the community by providing free healthcare, according to Maxine Gossell-Williams, who developed the MSc Biomedical Research Program at UWI. “They were interacting with patients, consulting them on medication, taking blood pressure,” Gossell-Williams said. Opportunities for creating change around the globe are not confined to the medical research field, either. In January 2019, MBA students will visit Ghana to improve rural electrification and waste management. Charles Darku is a retired managing director for Tullow Oil Ghana, a company that sponsors rural electrification projects. “Electricity enhances social life, it makes social communities so much better. So, the more people that have access to it, the healthier, the cleaner, the more resourceful they are,” Darku said. Darku said he hopes UB students going to Ghana in January will leave with a deeper understanding of public policy and economic development in the country. Alex Goldberg, a second year MBA student, said he looks forward to working on the rural electrification project in Ghana and learning about a different culture. “What I’m looking forward to most, personally, is the cultural differences and seeing how things work over there. … The project isn’t exactly something that’s in my wheelhouse so I’m really excited to learn a bunch of new stuff and facing that challenge,” Goldberg said. The GPS institute is a springboard for collaboration which welcomes students who want to engage with UB’s global collaborators. The institute will hold an event on Thursday, where students can meet with partners and discover their options for global learning. 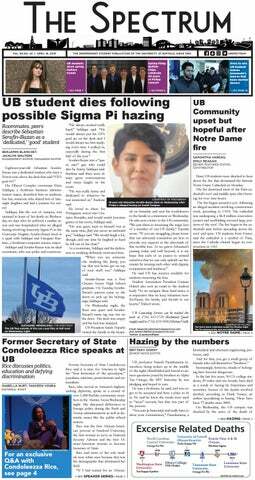 Tanveen Vohra is a staff writer and can be reached at features@ubspectrum.com.